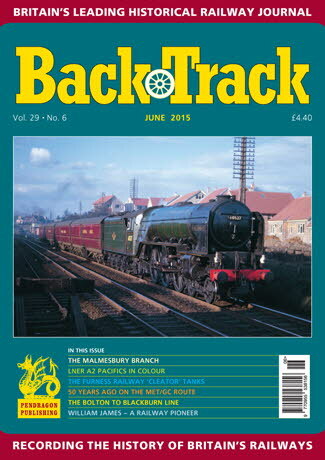 Railway Magazine | BackTrack June 2015 journal from Pendragon Publishing. More of Birmingham New Street as it used to be - three colour pages of Michael Mensing's photos of the station before its 1960s reconstruction. The unique Malmesbury Branch - Mike Fenton reflects on the life and times of a Wiltshire country railway. The Furness Railway 'Cleator' Tanks - Michael Peascod describes the company's six -coupled radial tanks of 1898. Around 50 years ago on the Met and Great Central line - Some reflections from 'Metroland' by John Jarvis. Newcastle District - Part Two of Michael Binks's account of the Civil Engineer's Department. The LNER A2 Class - the Peppercorn Productions - four-page colour spread. The Development of Railways to North West Scotland: Giving Access to the Western Isles - in Part Two Peter Tatlow explains how the Government became involved. William James: 'Man of Vision' - Stephen Roberts traces the life of a largely forgotten railway pioneer. The Blackburn Railway 1845-1858: Part One - Jeffrey Wells describes the origins and construction of this important Lancashire link from Bolton. A Horwich Success Story - four pages of archive photos of the LMS Hughes-designed 2-6-0s. A Shropshire Tragedy - Tony Robinson looks at a 'runaway' accident at Shrewsbury in 1965.